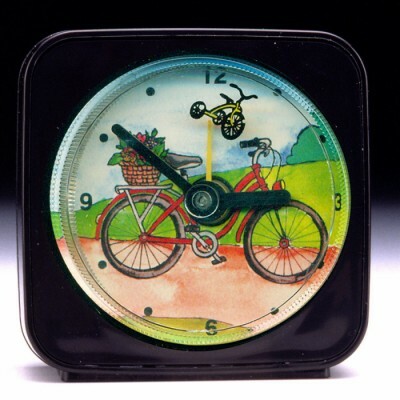 Our whimsical clocks and night lights are reproductions of Pam’s original paintings. Pam works in acrylics & watercolors and sometimes adds elements of collage to her work. She loves bright, deep, jewel tones and painting reflects a playful spirit and the infatuation she has for color. Pam draws inspiration from all her surroundings- from the natural beauty of the Pacific Northwest, to the playful interruptions from her feline muses Sadie and Ramona, who’ve inspired her many gifts for cat-lovers.